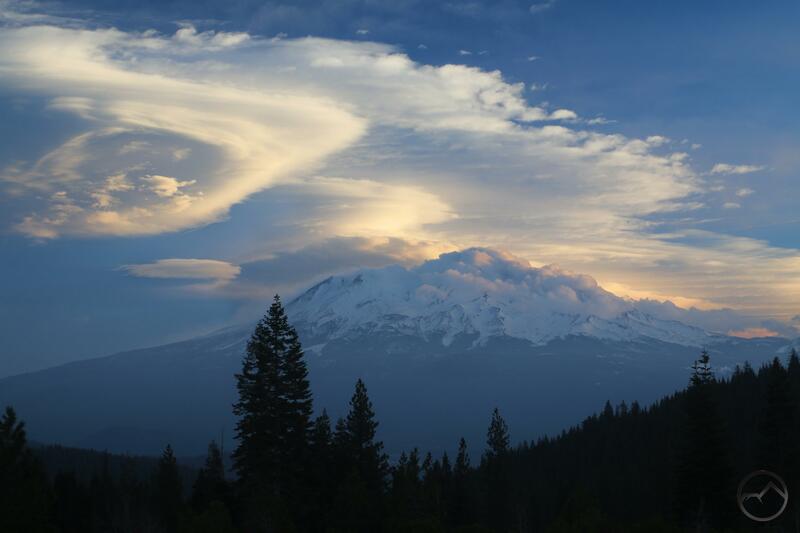 Mount Shasta is an awesome sight from Mount Eddy. Driving into Mount Shasta City, there is a sign stating that the community is “more than a peak experience”. This is certainly true, but, to transfer that sentiment to a different context, it is also more than a single peak experience. 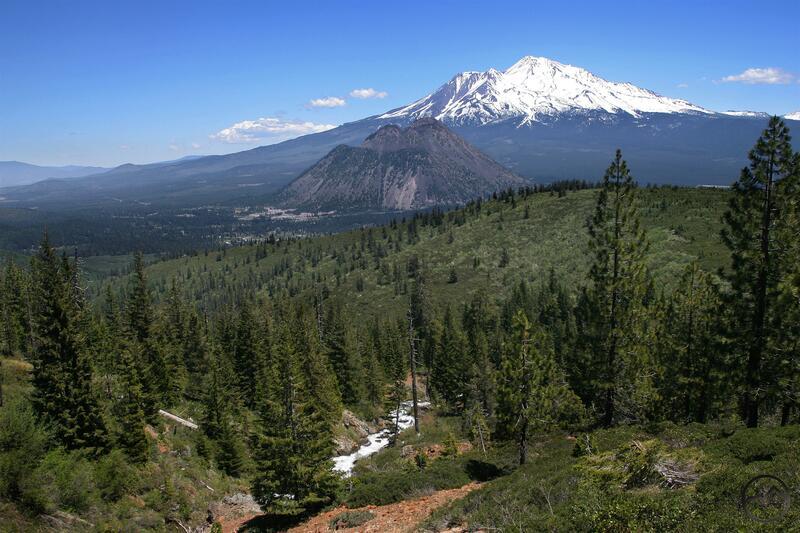 There are many other mountains around Mount Shasta that deserve attention besides the awe-inspiring volcano itself. Some of these peaks are rugged and craggy, some are more rounded and subdued. Most them, whatever their shape and character, have great vistas and are fun climbs. Their accessibility ranges from remote and difficult to easy to climb and get to. 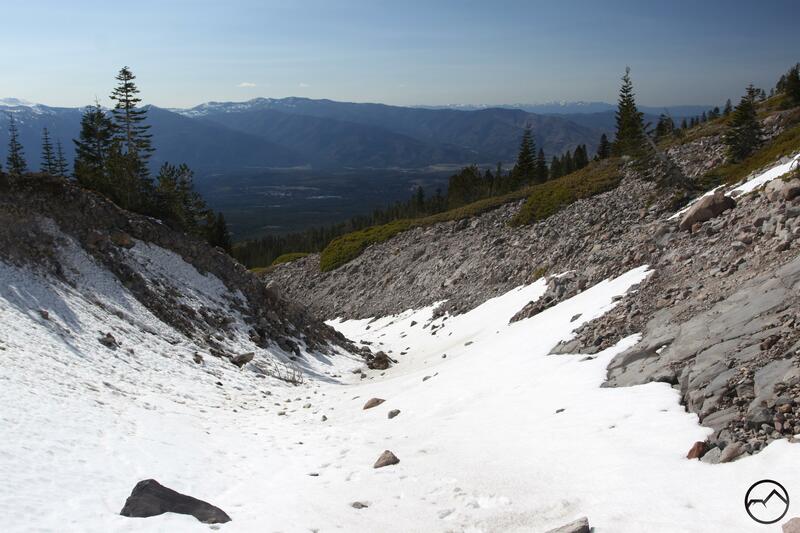 However, some of the peaks scattered around Mount Shasta are blessed to have trails leading to the summit, making them perfect for hikers looking to get an elevated perspective. Of course, since the paths lead to summits, they may not prove to be the easiest hikes, though they are generally not too challenging. Whatever your perception of their difficulty, the sight from the top is inarguably awesome and worth the effort to reach them. One of the high peaks on the Cascade crest north of Mount Shasta, the Goosenest is an old volcano that boasts lava flows and a large crater at the top. The trail to the summit is not long, though it does get a little steep in some places. Though the trail passes through some excellent old growth Shasta red fir, it is also one of the few places to find the very rare Baker Cypress, a tree that only grows in small pockets in a few northern California counties and even more isolated pockets in Jackson and Josephine Counties in Oregon. The trail ascends the rim of the Goosenest’s crater en route to the top, where incredible vistas await. The view is particularly awesome for how it shows Mount Shasta bottling up the southern end of the Shasta Valley. 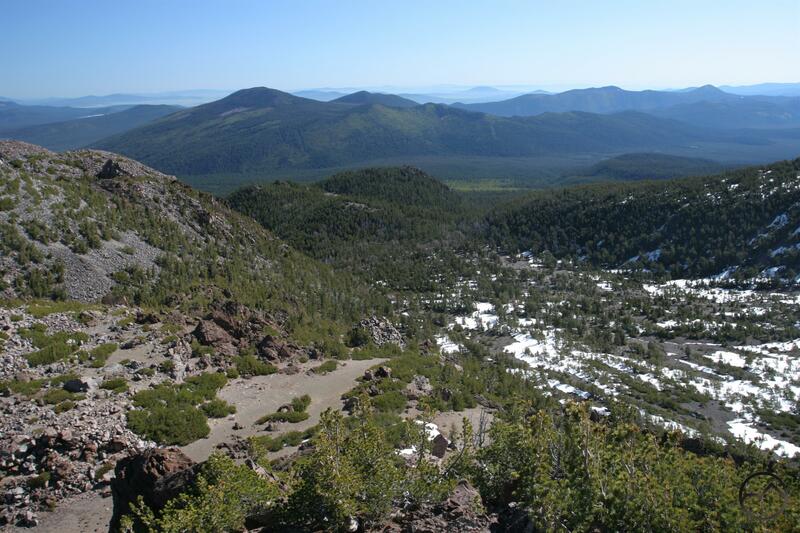 The hike up to Black Butte is one of the classic hikes of the Mount Shasta area. The trail was originally constructed to access a fire lookout that once occupied the summit. While the tower is long gone, the foundation still exists and it is easy to see why this was a good place to watch for fires. The mountain comes to a single pointy summit and there is a 360 degree panorama taking in all the mountains from Lassen Peak to the south to Mount McLoughlin to the north in Oregon. The climb up to the top has a few surprises along the way. The most notable is a canyon found on the peak’s north side. From below, Black Butte appears to be perfectly conical but one of the five eruptive episodes that created the mountain produced this talus-filled gully. The first thing to note about the climb to the top of Ash Creek Butte is that there is not exactly a normal trail. What there is is some old logging skid trails and then a narrow use-path through open terrain to follow. The route is not hard to figure out and the skid trail and the faint path are more than enough to make the route obvious. That being said, this is an incredible hike to an incredible peak. Loaded with fascinating geology and tons of solitude, the peak is also blessed with one of the most unique perspectives of Mount Shasta. 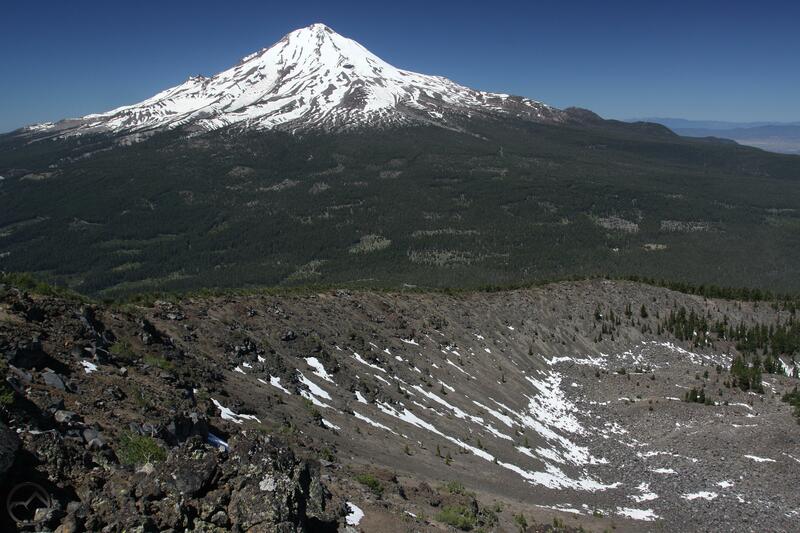 Situated on the great volcanos east side, this is one of the few vantage points where the giant secondary cone of Shastina is completely obscured. Consequently, Mount Shasta appears like a single, solitary cone, more typical of what one normally expects of a giant stratovolcano. It is an unforgettable sight. Though it seems unimpressive from town, this is one of the peaks prominently visible to the west of Mount Shasta City. On closer examination, Castle Peak is revealed to have rugged cliffs and a collection of excellent lakes tucked into basins around its flanks. 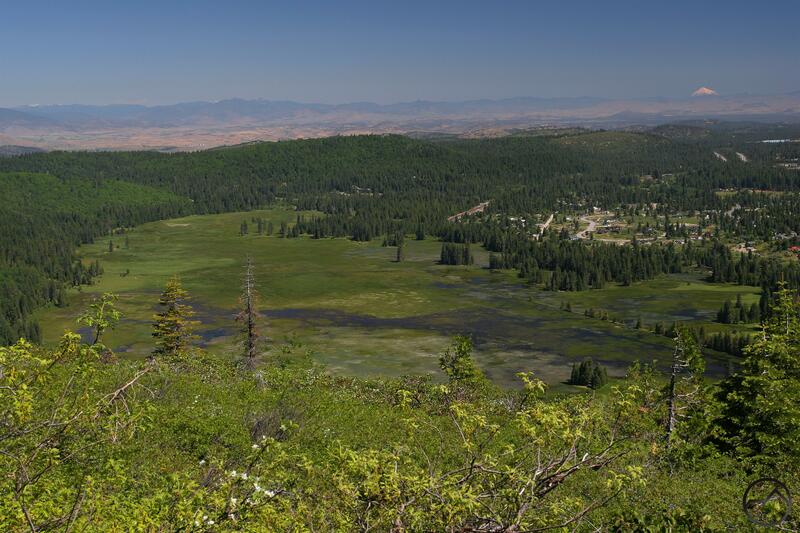 Chief among these is superlative Castle Lake, one of the finest mountain lakes in the entire Klamath Mountains. Above that is beautiful Heart Lake, owner of one of the greatest Mount Shasta vistas. Of course, Heart Lake does not have a monopoly on great vantage points, since the summit of Castle Peak is one of the finest in the region. Stretching from the northernmost Sierra Nevada to Southern Oregon, the view is particularly awesome when gazing down on the Castle Crags, the chaotic jumble of peaks, towers and spires rising dramatically out of a descending ridgeline. Of course, Mount Shasta might catch your attention too. The fact that Mount Eddy holds the number one spot on this list should come as no surprise. I have made no secret of my high opinion of this trail. It simply has the best combination of the factors that make a great hike. It passes through lush meadows, along rushing creek, through a gorgeous lake basin with numerous bodies of water and backed by dramatic technicolor cliffs and boasts the finest summit vista in the North State. It really is tough to beat. 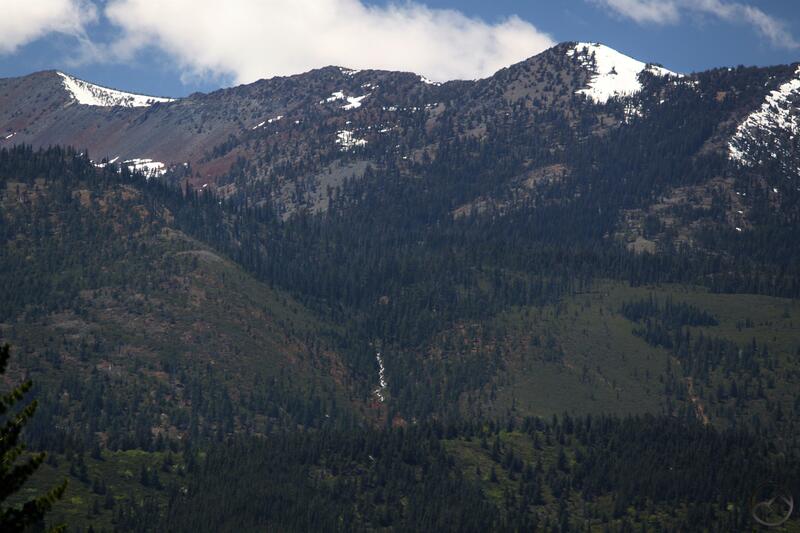 Worth noting is the presence of foxtail pines, a species that is only found around the Klamath Mountains but also hundreds of miles away in the southern reaches of the Sierra Nevada Mountains. With the warm weather expected over the weekend, the next few days will be a wonderful opportunity to get outside and enjoy the mountains one last time before the cold weather really begins to set in. However, with the road past Bunny Flat closed, there is sometimes a sense that the season has passed and the high country is now out of reach. While this may be true for the trails that begin up at the Old Ski Bowl, there are still plenty of fantastic high country trails that are waiting to be enjoyed. Some of the higher elevation may have some snow on the ground but in most places, there isn’t much more than a very thin layer of ice. Despite the lateness of the season, there is still a tremendous diversity of high country trails to hike. Whether on Mount Shasta or in the Trinity Divide, there is still time to get out and enjoy the Mount Shasta region’s incredible scenery! The following are five great options for excellent high country hiking this weekend. The giant volcanic cone of Black Butte is prominently visible throughout much of the Mount Shasta area. At 6,358, it is not among the tallest peaks around the great mountain but it does have a tremendous amount of relief, towering over 2,000 feet above surrounding area. It would be a major landmark in its own right if it were not for the obvious and overshadowing presence of Mount Shasta. Hiking to the summit of Black Butte is often impossible in the winter, when snow covers the trail and the exposure is very dangerous. Making matters worse, the snow lingers on the trail for a long time because of the route’s location on the peak’s north side. Right now the way is clear and this is a great time to enjoy the hike’s incredible views. While the last stretch of the Everitt Memorial Highway may be closed, it is still easy to drive quickly to high elevation at Bunny Flat. 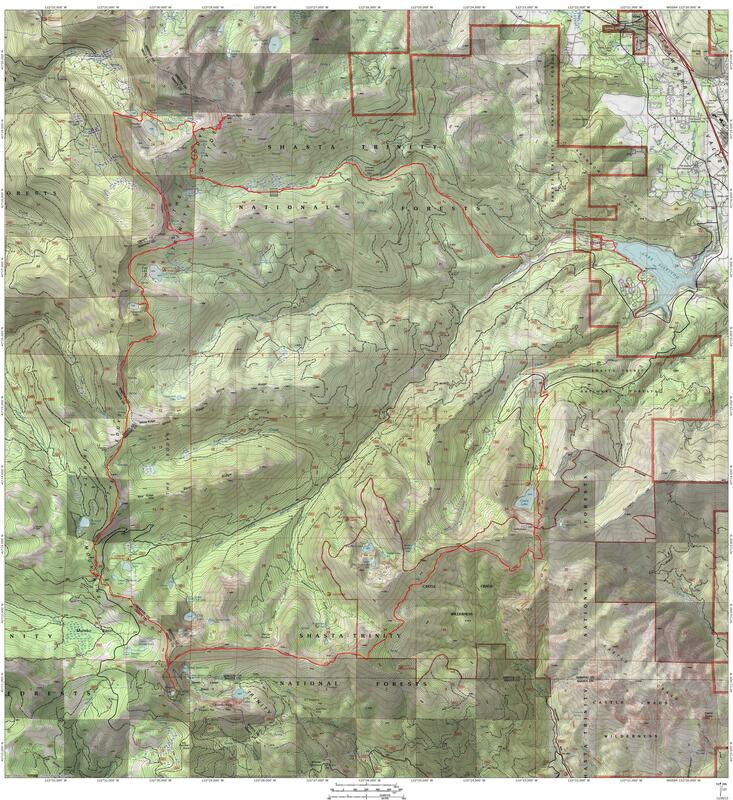 From here, you can hike either the Green Butte Ridge Trail or the short path to Horse Camp. The latter is preferable at this point because Green Butte does have some snow on it. Horse Camp, on the other hand, is below the current snow line and is reached quickly. From there you have numerous options for climbing higher. While the hikers headed to Helen Lake and Hidden Valley must contend with some of the white stuff, there is plenty of room to explore the lower areas of Avalanche Gulch without having to deal with any snow. This is one of the best trips in the Mount Shasta area and it is still a great option even though we are moving into the cold season. 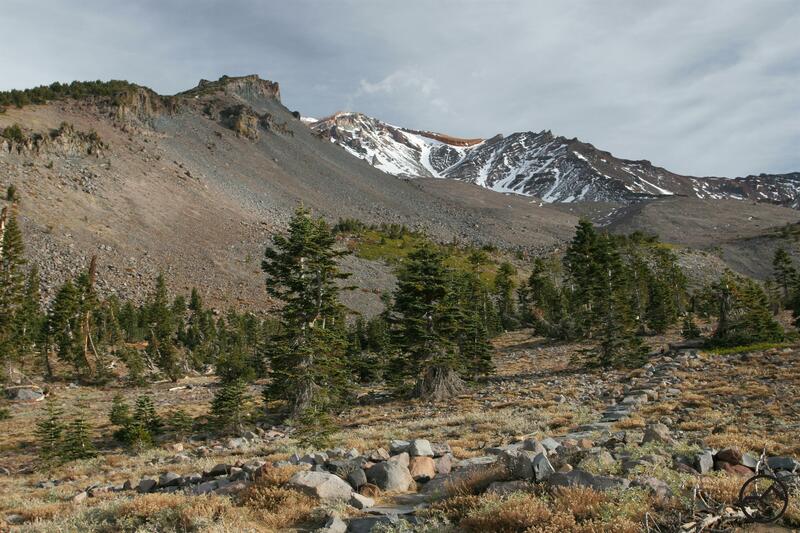 The hike follows the Pacific Crest Trail along the top of the Trinity Divide, with fantastic views in all directions. 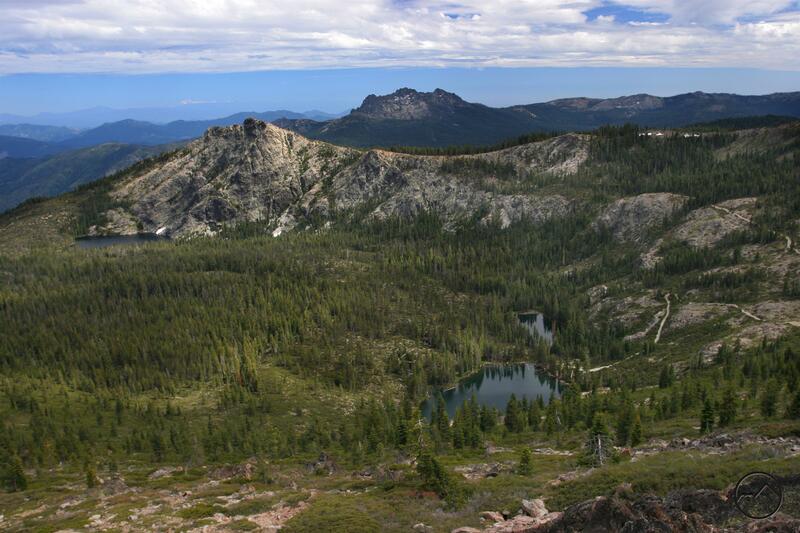 The vista is particularly awesome to the west, where the sawtooth towers of the Trinity Alps form a spectacular horizon. Not to be outdone by the western vista, the view to the east is utterly dominated by Mount Shasta. After a couple of easy miles on the PCT, the view of the Seven Lakes Basin unfolds beneath the trail. Many of the lakes are visible from here and the towering cliffs, Boulder Peak and the brooding Grey Rocks make a memorable scene. Hikers can continue further and visit Helen Lake or descend down into the basin to explore the rest of the lakes. The journey on the Clear Creek Trail is one of the most spectacular trails in California. 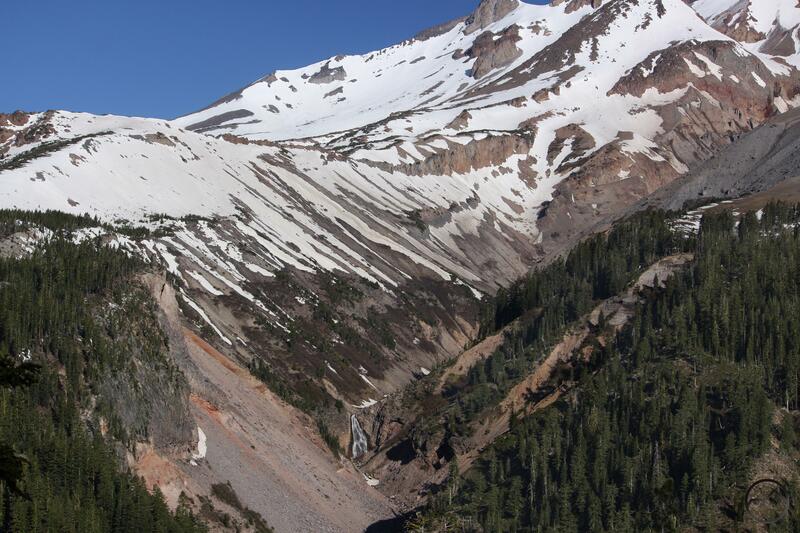 Even though there may be some snow higher up near the springs, the lower section is still an awesome trail with some of the best views of Mount Shasta, Mud Creek Canyon and Mud Creek Falls. The trip starts in old growth red fir forests and climbs onto the east rim of Mud Creek Canyon where there are epic views. Higher up the trail climbs into a large basin containing the headwaters springs of Clear Creek. The Konwakiton, Watkins and Wintun Glaciers all cling to the cliffs above the basin. Volcanic spires loom high overhead, marching inexorably toward Mount Shasta’s summit. While there may be a bit of snow in the basin right now, the odds are good that the going will still be easy. 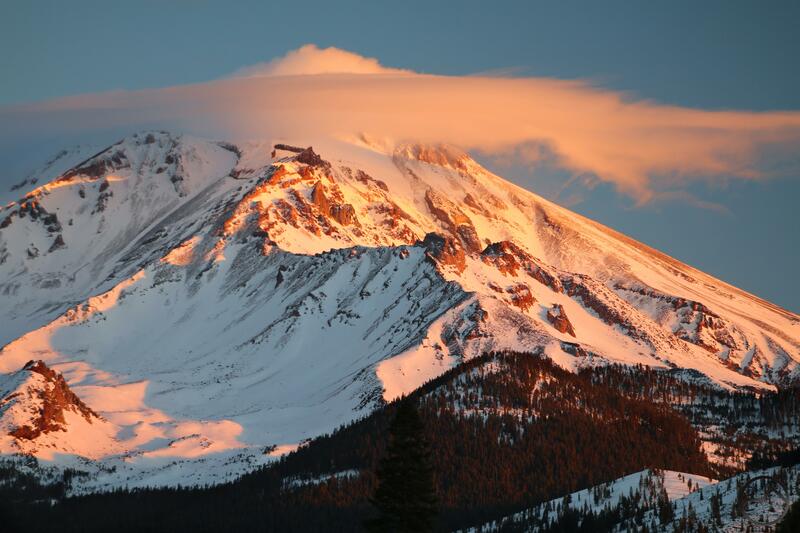 Often overlooked because of Mount Shasta, Mount Eddy is a tremendous mountain in its own right. The view from the summit is among the finest in Northern California and certainly the best north of Lake Tahoe. There is just a thin layer of snow near the summit and the rest of the trail is generally clear. 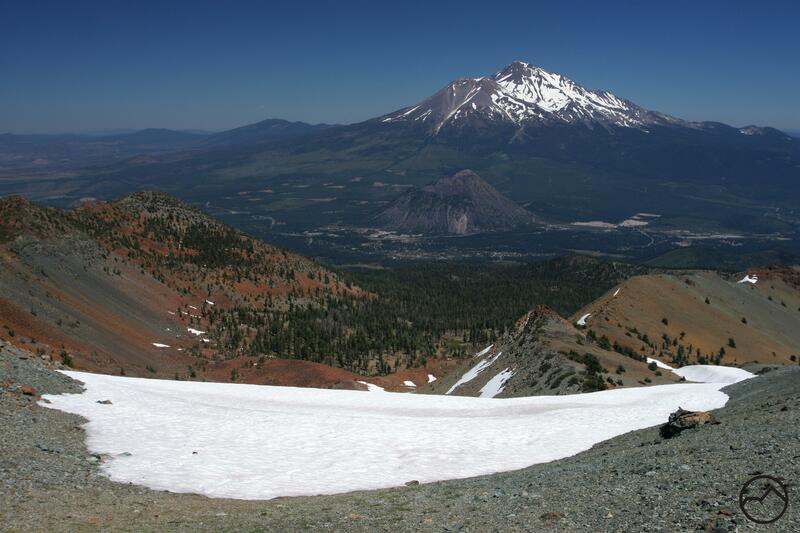 With Mount Shasta white and the way clear to the top, now is a fantastic time to climb to the view. If that were not enough, the hike passes through awesome Deadfall Basin, where the trio of lakes is an incredible destination on their own. Just hiking to the lakes is a fantastic high country trip; perfect the warm weather this weekend. While the summit of Mount Eddy may be a bit too much for little legs, the hike to the lakes via the PCT is a great outing for kids. Ash Creek Butte is dwarfed by mighty Mount Shasta. Mount Shasta is the unchallenged monarch of mountains in Northern California. No other mountain in the Golden State dominates the landscape the way it does. The mountain can be seen from well over 100 miles away in most directions. Its visibility is due in part to its unbelievably massive size and soaring height. Mount Shasta can also be seen from great distances because it towers so high above all the other mountains in the region. This is not to say that mountains that surround Mount Shasta are not high or lack impressive size in their own right. On the contrary, many of the peaks are quite remarkable on their own merits. Still few mountains can compare to the great height and incredible bulk of Mount Shasta. Being overshadowed does not mean that the lesser mountain around the mountain deserve to be cast into obscurity. They should still be appreciated for their own splendid qualities. Though they all exist in Mount Shasta’s shadow, the five highest peaks around the mountain remain extraordinary. They also represent the dramatic differences between the two mountain ranges that flank Mount Shasta. 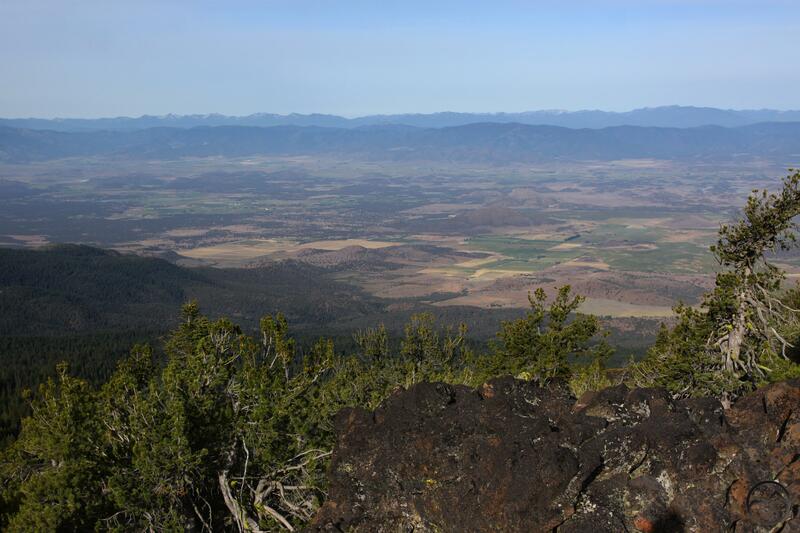 On the west side are Mount Eddy and China Mountain, both high peaks of the vast Klamath Mountains. 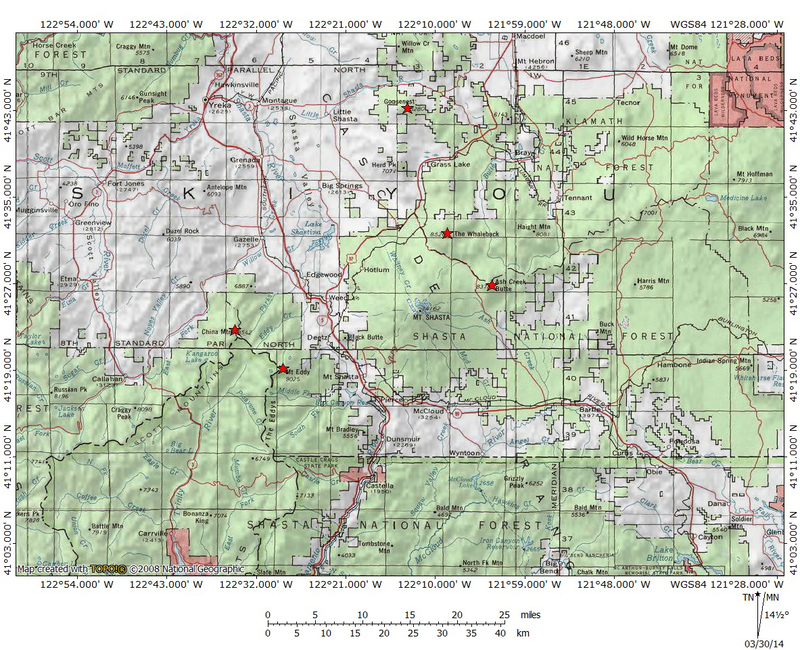 To the east and north of Mount Shasta are the Goosenest, Whaleback and Ash Creek Butte. 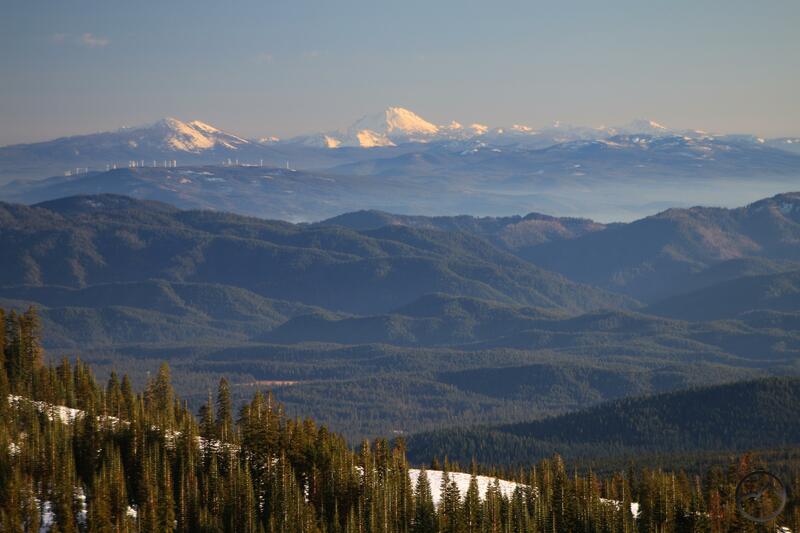 These three peaks are among the highest in the California section of the great Cascade Range. 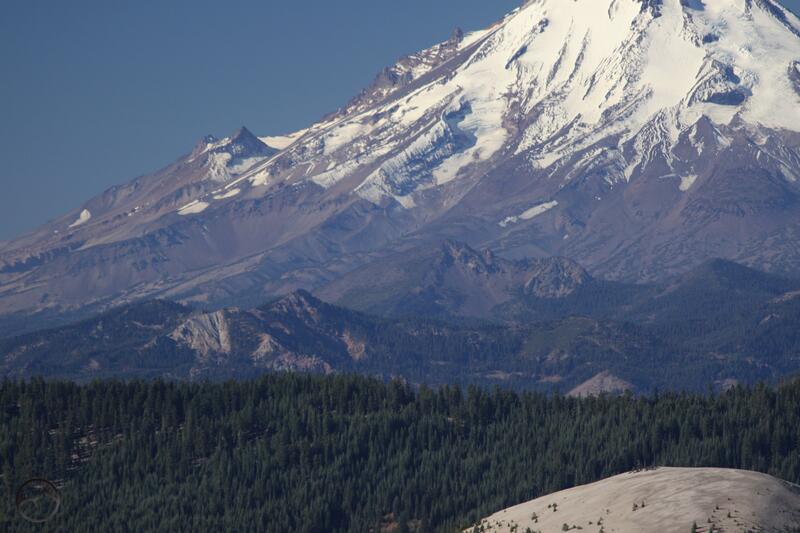 Not surprisingly, these peaks all have fantastic views of Mount Shasta. What are often less appreciated are the views of these high peaks from Mount Shasta itself. It should not come as a surprise that the trials on Mount Shasta yield excellent vantages from which to observe the mountains that surround Mount Shasta. Whether climbing these peaks to gain perspective of Mount Shasta or hiking on Mount Shasta and gazing down at the mountain’s neighbors, these five peaks deserve more consideration than they often get. Mount Eddy seen from the South Gate Trail. 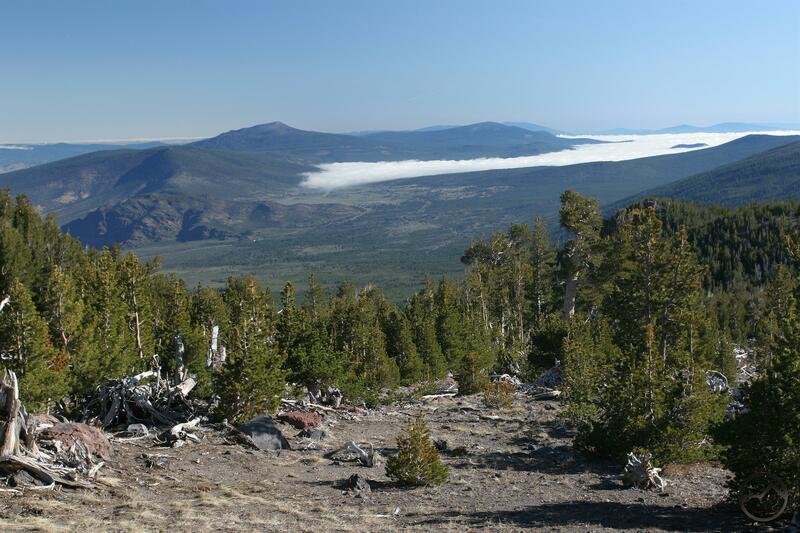 The highest point in both the vast Klamath Mountains range and its subrange, the Trinity Divide, Mount Eddy is a colossal mountain in its own right. Boasting an awesome array of alpine lakes and verdant meadows, Mount Eddy is almost large enough to be considered a small mountain range on its own. Composed of peridotite and serpentine, the mountain is an unusual patchwork of bright yellows and reds. It is definitely one of the more colorful mountains in the Mount Shasta area. Mount Eddy has experienced significant glacial activity in the past, as evidenced by its deep lake basins and soaring vertical cliffs. 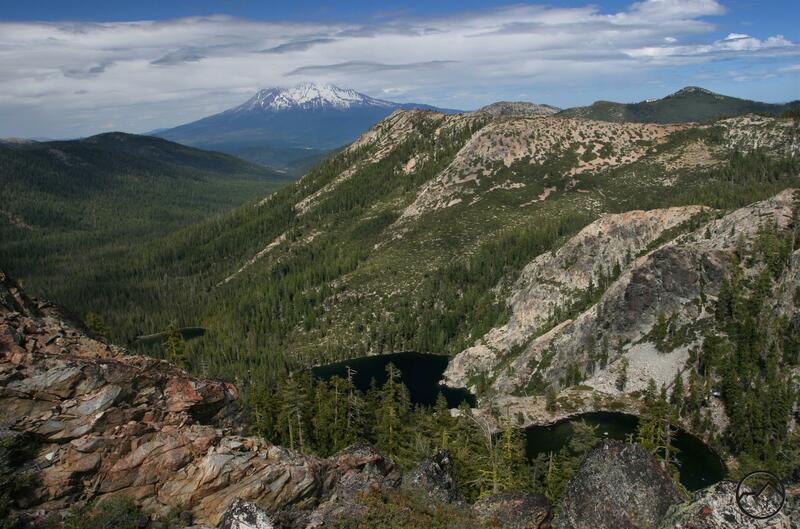 While hiking on Mount Shasta, it is difficult to miss the brooding massif that is Mount Eddy. 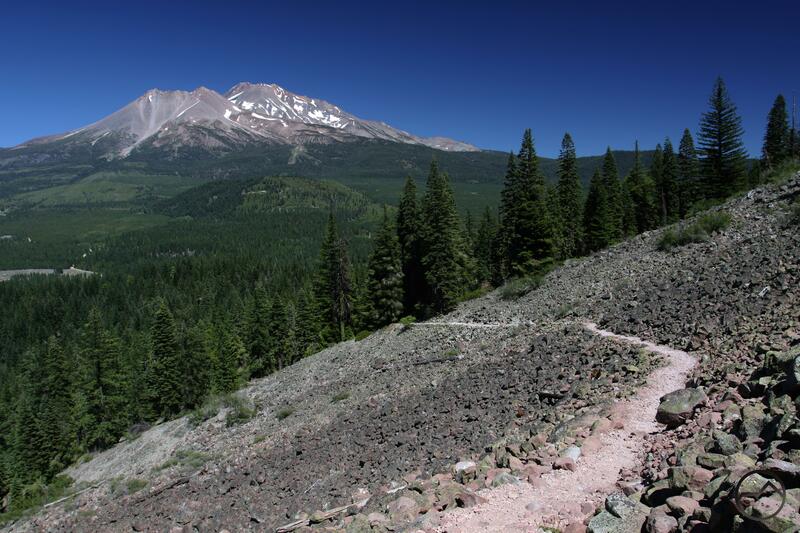 Both the Green Butte Ridge Trail and the Old Ski Bowl section of the South Gate Meadow Trail have spectacular views of the highest mountain around Mount Shasta. China Mountain observed from Diller Canyon. Easily the most obscure of the five highest peaks around Mount Shasta, China Mountain rarely ranks high on hiker’s lists of favorite mountains in the Mount Shasta region. This is unfortunate because hikers who ignore China Mountain are missing out on one of the most rugged and beautiful mountains around. Blessed with sheer cliffs and three lake basins, the China Mountain area always seems to be overlooked. Despite the obscurity, the mountain has much to offer hikers. The three lakes basins make great hiking and scrambling destinations. At the same time, because of its obscurity, China Mountain offers nature-lovers a deep since of isolation. As if reflecting the obscurity of China Mountain, no trails on Mount Shasta offer really exceptional views of the peak. However, for those explorers fortunate enough to make the journey into Diller Canyon, a tremendous view of China Mountain awaits to the west. The Whaleback viewed from the North Gate Trail. One of the most prominently visible peaks to the north of Mount Shasta, the Whaleback gets its name because the large mountain is thought to look like the back of a diving whale. 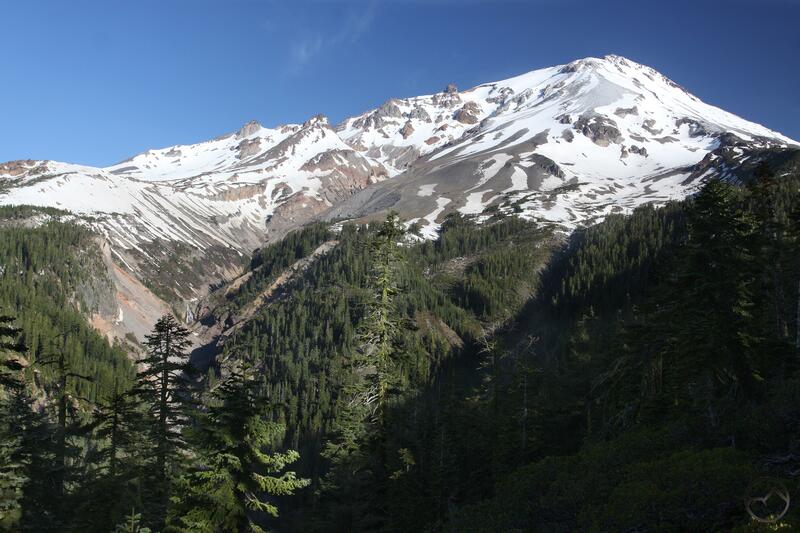 Excluding Mount Shasta, the Whaleback is the highest peak in the Cascades between Crater Peak in the Lassen area and Mount McLoughlin in Oregon. Like the vast majority of summits in the Cascades, the Whaleback was once an active volcano. A small crater is situated just below the summit. The small summit and great bulk of the mountain are typical of shield volcanos. These are formed by numerous, successive volcanic eruptions. Lava spills out layer after layer, gradually building the mountain up. The area around the Whaleback saw significant logging activity in the last century but much of the mountain is still covered in large stands of virgin timber. The heavily wooded peak, combined with the its rounded summit give the Whaleback the least rugged appearance when compared to the other high peaks around Mount Shasta. Since it is situated on the great mountains northeast side, the lonely North Gate Trail offer great views of the Whaleback is it climbs up to the foot of the North Gate plugs. Ash Creek Butte rises beyond Brewer Creek. 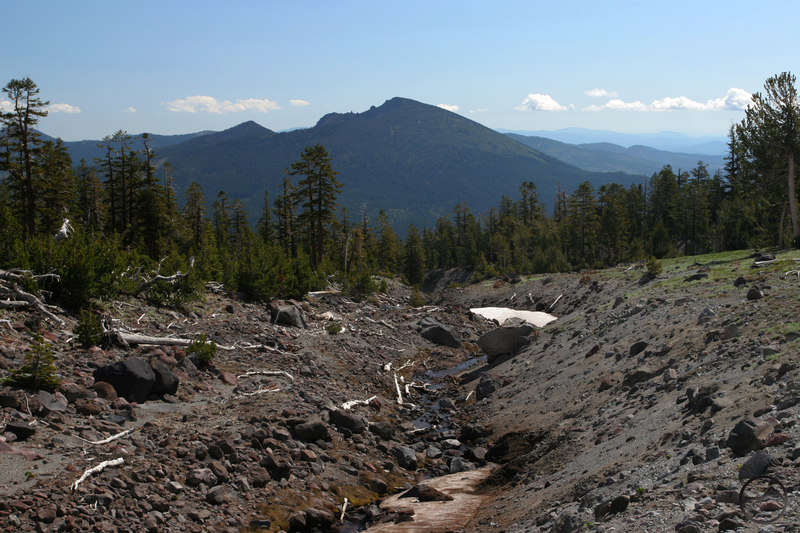 While the other Cascade peaks around Mount Shasta could be described as having rounded summits with small craters, Ash Creek Butte is a strikingly rugged and craggy mountain. 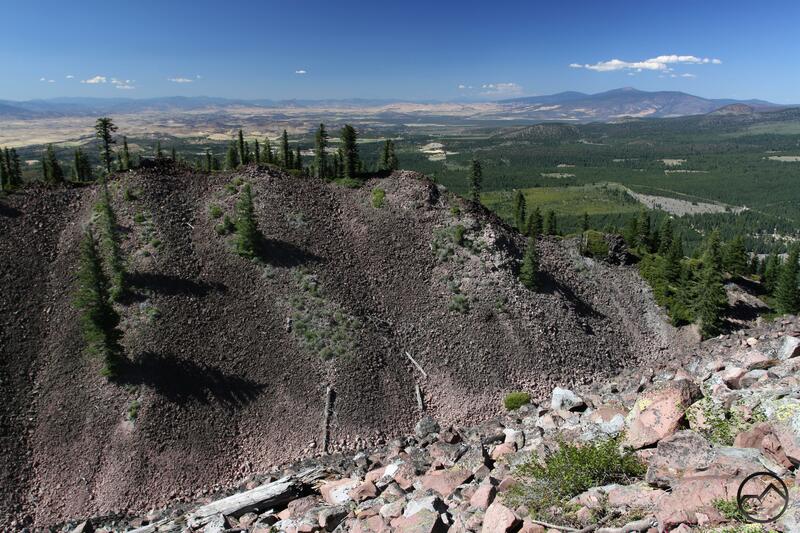 Rising to a narrow, pointed summit, Ash Creek Butte exhibits significant glacial activity. At least two major glacial cirques are found on the mountain’s north side and a possible third cirque is located on its east face. The cirques were once home to large glaciers that ground the rounded, smooth-sided mountain down and exposed gaping, rocky canyons in their wake. The Surprise Basin on Ash Creek Butte’s north side is the most impressive. Though the glaciers are gone, much of their detritus remains in the form of Surprise Lake, a smaller, unnamed lake and a large fossil rock glacier. This peculiar feature was formed when portions of Ash Creek Butte collapsed after being undermined by the glacier. The collapsed debris covered the glacier, which subsequently melted away. The debris now appears like the fossilized remnant of the glacier. 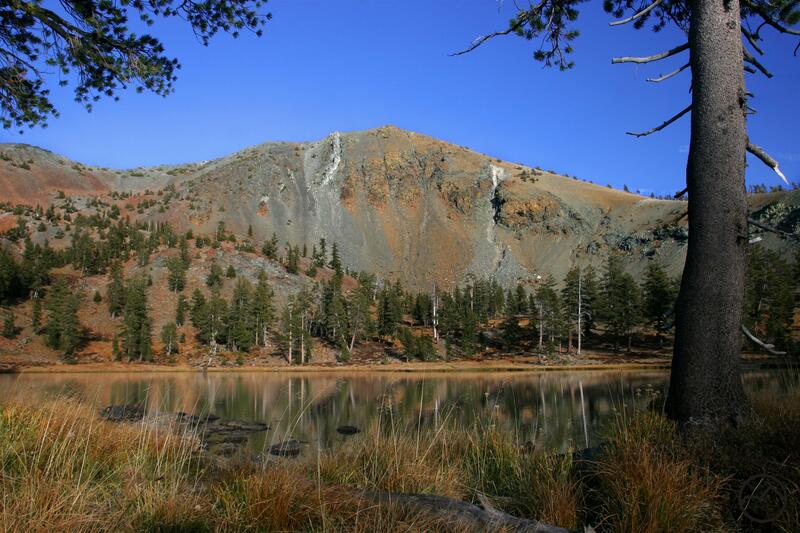 Of all the high peaks around Mount Shasta, Ash Creek Butte is the most isolated and least known, though it is also the most impressive in appearance, other than Mount Eddy. The best views from Mount Shasta trails are found on the equally isolated Brewer Creek Trail, particularly from Brewer Creek itself. The Goosenest rises above the Cascade crest. 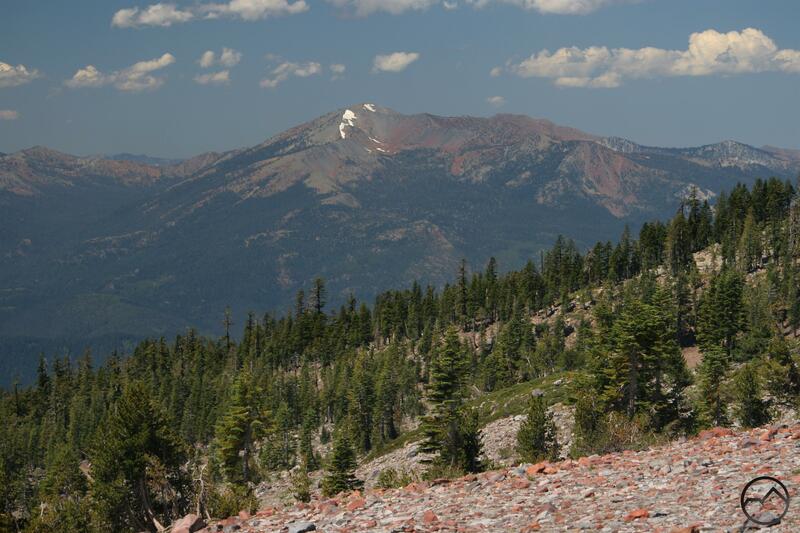 Classic volcanic peak, the Goosenest is the most prominent summit on the east side of the Shasta Valley. The rounded, dome-like summit is blanketed in large lava flows. Though the woods have begun encroaching on the large flows, they are still easily discerned from far below in valley. The summit consists of a largely bare, ashy rim around a deep crater. The rounded rim is what gives the mountain its nest-like appearance. Two trails wind their way to the summit. On the north side is a maintained foot path. The south side is traversed by an old road that climbs up from an old quarry. The foot path is a much nicer climb. 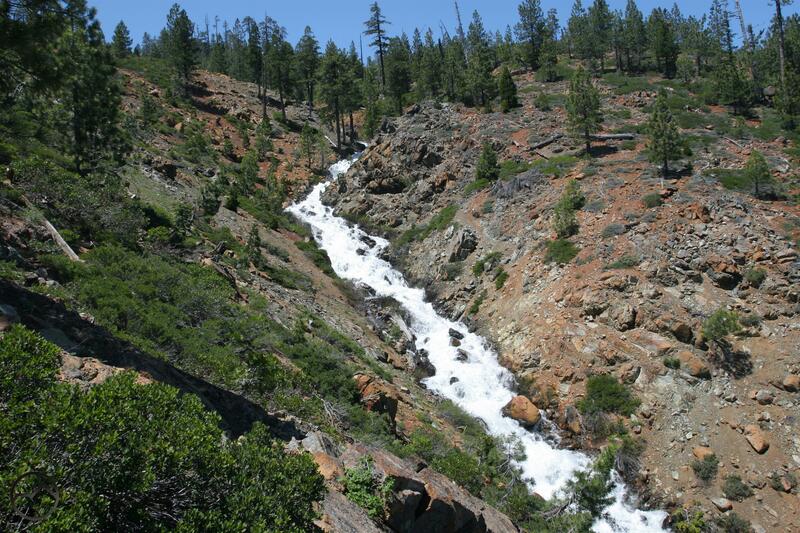 Despite the Goosenest’s great visibility throughout the area to the north of Mount Shasta, it is only prominent from a pair of trails, the Whitney Falls Trail and the North Gate Trail. The latter in particular has the best views since it climbs high enough on Mount Shasta to gain a perspective that shows the Goosenest rising high above the other peaks on the Cascade crest.